The 20th century was a tumultuous one, and – as a new exhibition at the Art Institute of Chicago demonstrates – artists responded in a variety of ways to its social, technological and political upheavals. We spoke to the curators Sarah Kelly Oehler and Elizabeth Siegel about the show, which aims to disrupt visitors’ assumptions about modern art. ‘Shatter Rupture Break’ is the first exhibition in the Modern Series, a succession of collection-based shows meant to explore the breadth and depth of the Art Institute’s modern art holdings. The first half of the 20th century was a period of tremendous change – two world wars, new technologies that accelerated the pace of life, new understandings of psychology and the mind, and the disruption of old artistic traditions – and artists responded with both exhilaration and anxiety. We wanted to explore how the idea of rupture permeated modern life in Europe, Russia, and the Americas and served as an inspiration for revolutionary formal and conceptual developments in art-making that remain relevant today. The exhibition is unusual in that it unites objects from across the entire museum – from seven curatorial departments as well as the library – and juxtaposes them in provocative groupings. Some are beloved icons of the collection, whereas others are relatively unfamiliar, and hopefully will be a revelation. This diversity of objects also reflects the fact that, in contrast to the ways museums often isolate types of objects in individual galleries, modern artists did not limit themselves to a single medium, but were creatively inspired by working in painting and photography, film and designed objects. Another distinctive feature is the show’s reliance on the voices of the period – instead of curatorial texts, original quotes from artists, authors, scientists, and other intellectuals give vivid context to the works of art. Several years ago, as the Art Institute began a museum-wide process of planning for the future, the various curators with modern art holdings began to meet regularly to think about how we could showcase the entire collection in innovative ways. We developed a list of themes that cut across curatorial departments, and the idea of fragmentation quickly rose to the top as a central concern of the period and a fertile idea for a show. Although the two of us are the lead curators of ‘Shatter Rupture Break’, the process has been highly cooperative from the very beginning, with input from staff in many different areas of the museum. With this many different media represented, there should be something to appeal to everyone, whether you are a film buff, love paintings, or think collage is fascinating. Liz’s favorite is what we call the ‘body wall’, a salon-style installation of works showing the body rendered as fragments, whether through the violence of war or Surrealist fetishism. 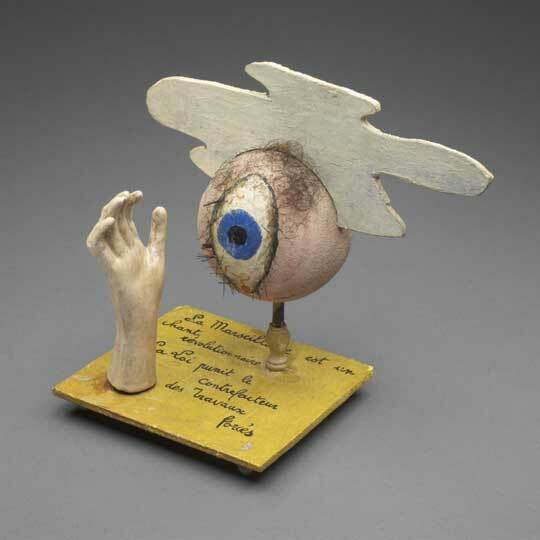 The only surviving Claude Cahun surrealist object, an Eames bent plywood splint from World War II, and Umbo’s photographs of mannequin parts all play off each other in a charged and evocative display. Sarah loves the group of self-portraits by photographer Stanisław Witkiewicz – particularly the fantastic image he made by breaking and reassembling a glass negative, which he then printed. It conveys an extraordinary sense of a shattered psyche. We each have our professional specialisations: Liz is a curator of photography, and Sarah of American art. For each of us, it’s been so exciting to think more broadly about modern art and its interconnected nature. We’ve also had a chance to work more closely with some of our great colleagues – learning from them and exploring the riches of their particular collections. (We saw parts of the museum we had never entered before!) The process alone has been stimulating, and it has been a wonderful reminder of why we chose to be curators. The space is designed to encourage visitors to make their own associations. Instead of being organised with an obvious narrative progression, the installation is layered and overlapping, and is intended to foster a more open-ended and flexible experience. One challenge was to integrate films squarely into the exhibition space; we wanted to affirm the status of film as equal in significance to the more traditional media in the show. But we welcomed the spillage of sound and light that comes from prominently displaying film – it contributes to the dynamism of the installation. Also, the exhibition galleries consist of two larger rooms connected by a hallway, which is often treated as a simple pass through, but we used the corridor as a key place to situate the intellectual heart of the show – the quotes from a wide range of sources that contextualise the artworks in both galleries. Given the richness of the Art Institute’s collection, the challenge was what not to include! But we didn’t want to denude the walls of the permanent collection galleries of European and American modern painting and sculpture. People might be surprised at what we chose to highlight and what we downplayed – for example, we deliberately deemphasised Cubism. There were many ways that artists explored the idea of fragmentation, and Cubist distortion was just one way. We wanted to challenge visitors’ expectations of modern art, and one way to do so was to be very free and even playful in our thinking about the theme. We hope that people are pleasantly surprised at what they find. ‘Shatter Rupture Break’ is at the Art Institute of Chicago from 15 February–3 May.